Firstly, Staub is the highest quality enameled cast iron cookware on the market. Instead of lowering quality to reduce costs, emphasis on has been on producing some of the world best quality cookware. if you want some cookware that will last a life time then try Staub cast iron cookware. Secondly, Staub combines traditional craftsmanship with modern technology. Thirdly, the cookware is not like grandmas silverware, that is high in maintenance and is only brought out on special occasions. The cookware is beautiful and durable for everyday use, requiring no maintenance. Furthermore, if you are looking for quality cookware either for yourself or as a gift. Its hard to find better. Staub also offer a wide range of cookware, we give a product overview on so other goodies you may be interest in. Benefits of cast-iron with the maintenance. Firstly, Staub cast-iron uses at least two layers of coloured glaze to entirely cover their cast-iron pieces. Enameled cast-iron doesn’t need the same maintenance as bare-iron but keeps many of the benefits such as heat retention and durability. Secondly enamelware is that it is easy to clean. Its a happy medium between bare cast-iron. 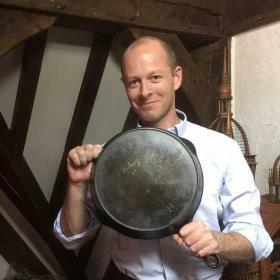 Firstly users of cast-iron tend to be careful not to lift the seasoning and usually refrain from using scouring pads. Secondly Stainless steel, food seems more prone to sticking. Enameled cast-iron can be placed in the dishwasher. Although I would recommend owner to hand wash to increase the longevity and gorgeous colour of Staub hollowware. Enamelware can be soaked in water and releases food easily. Metal untensils and sponges can be used since Staub enameled cookware is scratch resistant. Enameled cast-iron non-reactive to acidic foods. Thirdly glaze used to enamel cookware is non-porous and hard. Perfect to cook highly acidic foods that can react which metal cookware and taint the taste of food cooked. Many people consider enameled cookware one of the safest options to cook on. Enamelware cookware totally separates any contact of food with metal and non-stick surfaces such as teflon. Staub cast iron cookware is some of the the most stunning looking cookware I’ve seen. Not only is it made to be used everyday it’s is gorgeous. Theres no need for special saving dishes. The cookware looks gorgeous on the table. Looking at pieces you know they are superbly well made. Colours are deep and rich. I cannot chose my favorite. I own several matte black pieces to complement my antique cast-iron skillets and couldn’t be happier, although I have to admit sometimes I have an envious eye deeply rich blue and green cocottes. If purchasing a braising pot or cocotte your Staub piece comes with a tight fitting lid. The tight fitting lid keeps moisture from escaping and evaporating. Since the spikes under the lid, drop moisture evenly back into food being cooked keeping meat tender vegetables retaining their natural favours. In addition heavy lids designed to stop moisture escaping is perfect for slow cooked meals. Enameling is not easy and the French have been experts at it for centuries. Equally important, you may have seen lower cost enameled cast-iron cookware with huge chips in the glaze. This is even before leaving the store. I’ve also heard owners chipping their cookware with careful use. Staub are experts at enameling cast iron. They use a base coat to smooth roughness and at least two layers of glaze to give their piece a deep rich finish that is resistant to chipping and scratching. 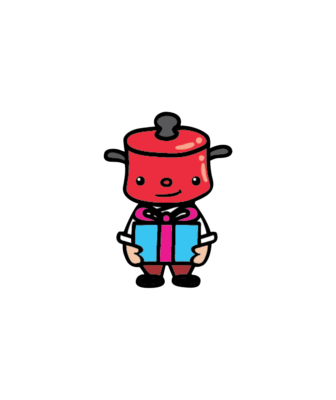 If you are looking to buy as gift I recommend very strong brands names like Staub and Le Creuset that pride themselves on making quality enamelware as their signature products. Craftsmanship as mentioned is high quality pieces. Staub is a relatively new company competing in the extremely competitive cookware market. Staub has focused in quality. Each pieces is truly unique and has its own characteristic. Since employees check each piece individually to smooth any rough edges, no two pieces of Staub made cast-iron are the same. Staub like Le Creuset use individual sand molds to make their pieces then each inspected before glazing. The matte black seem slightly rougher on the inside of the handles compared to the glossy coloured pieces which have smoother finish. This gives each piece personality and characteristics I can only compare to antique cast-iron. During the firing process glass is heated to 750ºC – 850ºC (1380ºF – 1560 ºF). Enamel can easily crack in the firing process. Similarly Le Creuset and Staub uses at least two coats of glaze and an undercoat. This separates Staub and Le Creuset from other cheaper enamelware. Firstly Staub uses metal knobs as standard on their products. Their flagship matte black pieces come with a brass knob while their coloured piece come with a nickel plated knob. Metal knobs are heat resistant up to 250ºC/482ºF. Using metal knobs differentiates Stuab from their competitors and highlights their importance in quality and attention to detail. 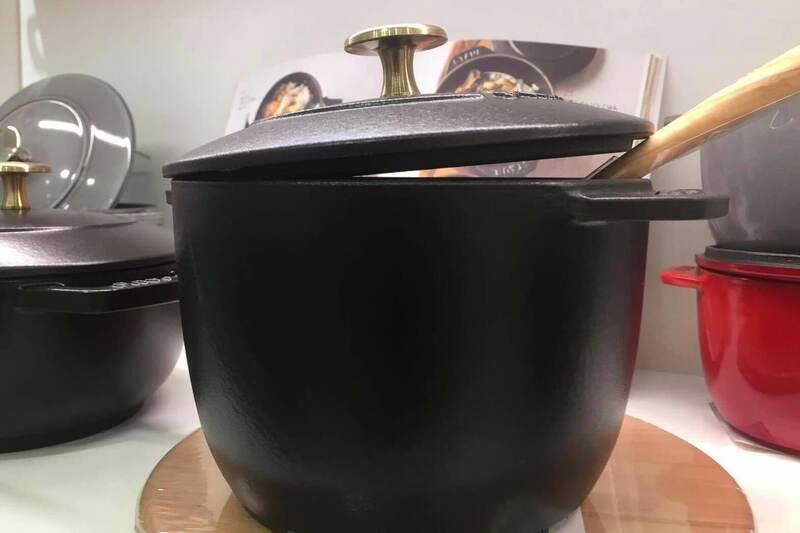 Since Staub cast iron cookware have black interiors food stains are less apparent. Another point to consider the cast iron manufacture is it makes their cast-iron products locally in France. It is so easy for manufactures to move overseas with cheaper labour and lower cost of production. 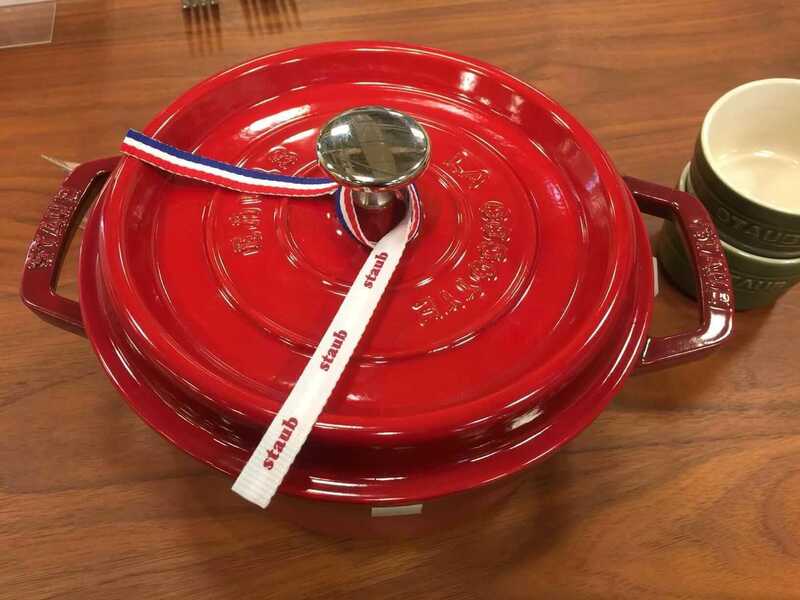 Staub chooses to manufacture their enameled cast-iron in their hometown, in the beautiful region of Alsace which borders Switzerland and Germany. Finally, if you are looking for the same benefits of cast-iron without the maintenance, Staub and Le Creuset are ideal choices. They are scratch and chip resistant and use multiple layers of glaze. The cookware is incredible durable, long lasting and beautiful. If you would to lear more about why love our Staub please click “here”. Staub being a little lesser known than Le Creuset in America, are often conversation pieces in the kitchen with friends and guests. Similarly to Lodge manufacturing, Le Creuset, Staub make perfect gifts for friends and weddings presents. they are high quality piece that will give the user decades of use. Additionally Staub is an exceptional brand that specializes in cast-iron enamelware. if you want to up-grade your regular cast-iron skillet or try cast-iron cooking for the first time Staub cast iron cookware is a great choice. If your still not convinced, We go into further detail on the Staub cocotte. Previous articleStaub Cocotte, why I think it will be on your wishlist. Next articleWhy buy Staub cookware? This proud owner explains why.